So... does this up-scaled version of Megatron's most loyal Communications officer drown out his counterparts? Take a peek after the jump! Soundwave has always been one of my secondary favorites. While I don't have a huge collection of Soundwave figures, I've always appreciated one when I got it. Soundwave was the stoic right-hand to Megatron. Never really talking much, but always listening in on what everyone else had to say and making sure that nothing happened to his leader. The gimmick of of having a Transformer that was a tape deck that shot out little transforming minion tapes was always a cool idea to me. 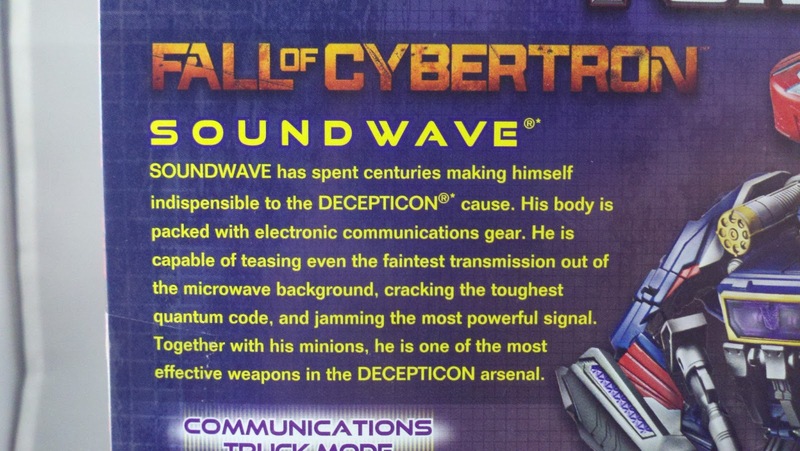 Hasbro certainly gave Soundwave his own little force with which to spy, fight, and wreak havoc with. 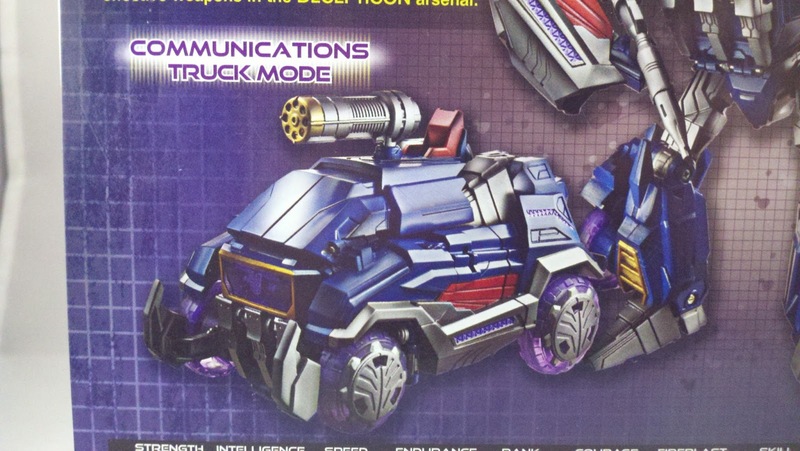 When the Generations line released the initial Fall of Cybertron figures, we received a very screen accurate rendition of Soundwave's Cybertronian 'Communications Truck' mode. Sadly, we never received any of his minions; his chest was built to hold his weapons, not his 'tapes'. Hasbro finally decided to give us something a little more; a larger Soundwave that could actually accommodate a minion... or three. 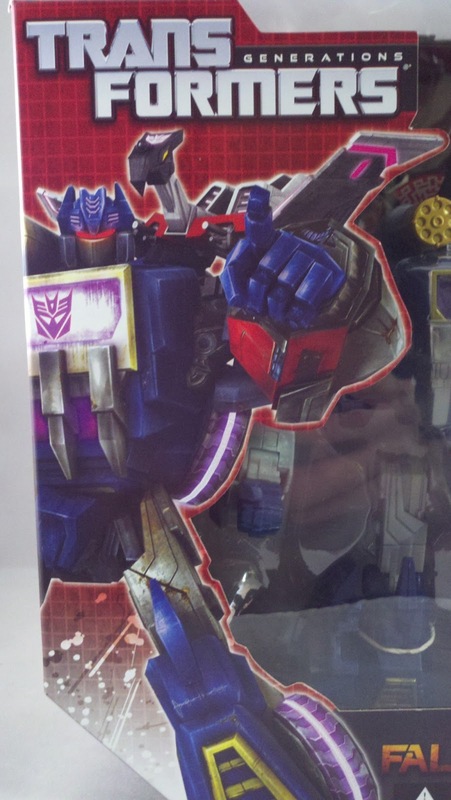 FoC Voyager Soundwave comes packed in what has become the standard for the Generations line. A red window box with some astounding character art. 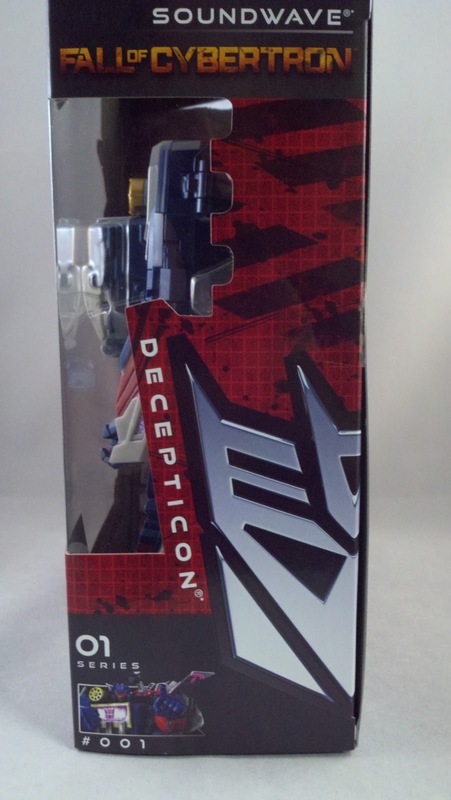 The front of the box gives us a good view of the figure in his Bot-mode with Laserbeak pack in 'Bot'-mode as well behind him. 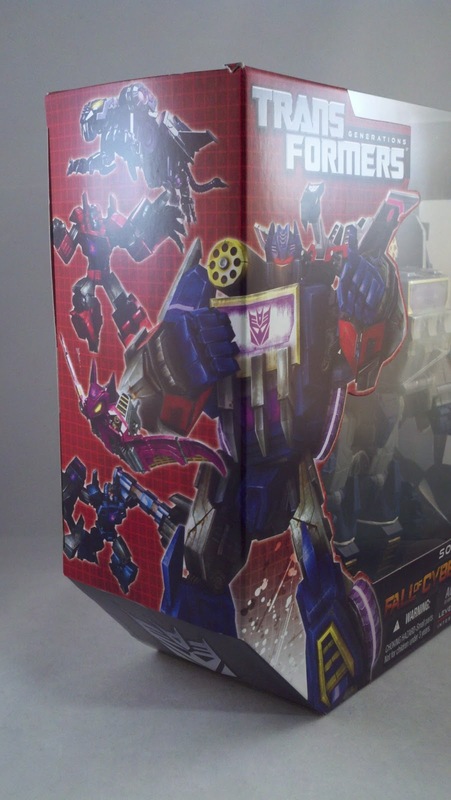 The wrap-around art that adorns the front and side of the package shows off Soundwave and all of his minions. It is some really beautiful work. 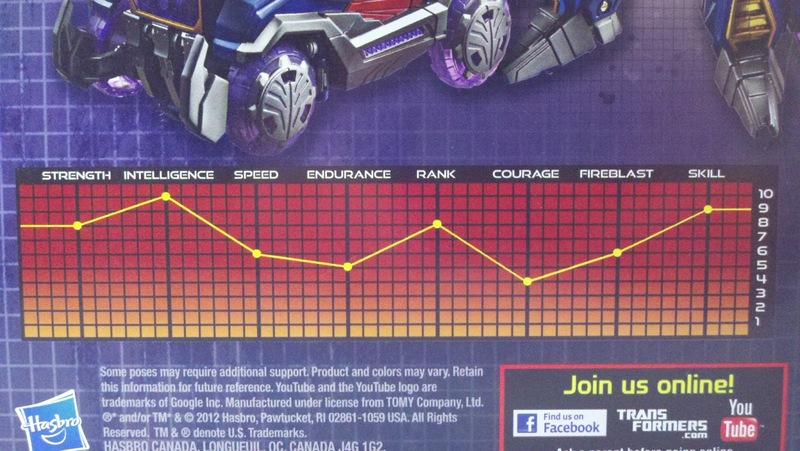 The back of the package give us shots of both Soundwave and Laserbeak in both Bot and Alt-modes. We also get the standard bio and Tech-Spec. 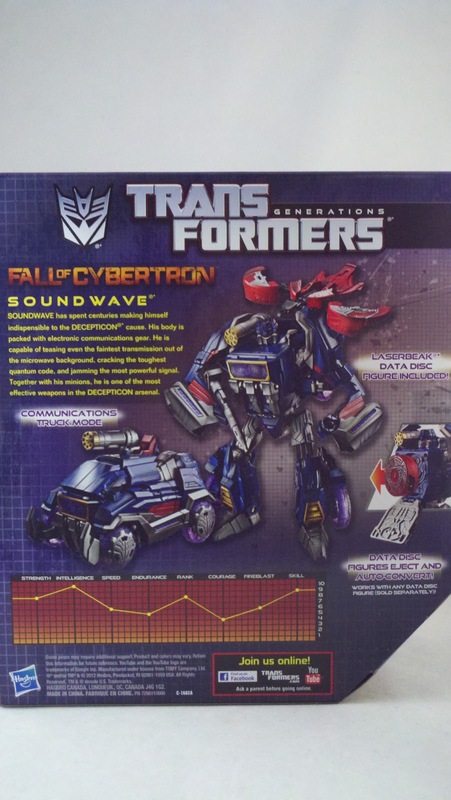 The bottom right corner also gives us a glance at the gimmick built into Soundwave, the data-disc storage and ejector. The bottom of the box gives us a shot of the other figures that are available. Specifically, Soundwave's other minions that are available in 2-packs. Soundwave comes packed in Bot-mode, but I figured that since I needed to figure him out, why not get him to Alt-mode and go from there. Soundwave's Alt-mode is a fairly good representation to his on-screen counterpart. I say fairly good as he looks a little bloated and not as stream-lined as his Deluxe scale counterpart. 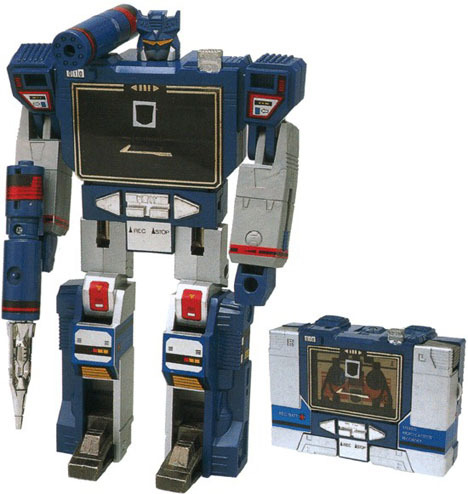 Soundwave is molded in primarily blue and grey plastic. His wheels are molded in a translucent purple as is his front windscreen. He has quite a few paint apps, but nothing in the way of big detail. Some light purple lends to the glowing look that was a running theme in both WFC and FoC. 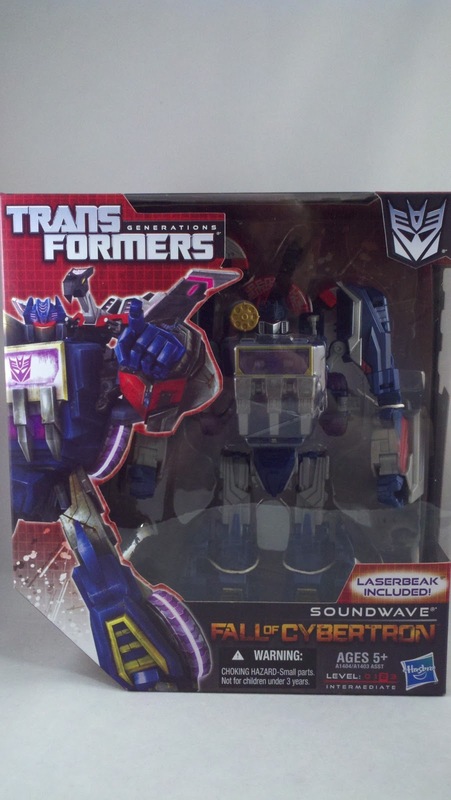 Soundwave comes packed with 2 things, the tape devolved to data-disc version of Laserbeak, and only one weapon. This solo weapon is Soundwave's signature shoulder-mounted missile pod. He unfortunately does not come with his unique rifle. The missile pod can be mounted on top of Soundwave's Alt-mode. Laserbeak himself is molded in primarily molded in red and black with silver paint apps. Most of the detail is on the data-disc side... all sorts of techno-like lines... with a few other plates painted silver as well. His head has not paint apps whatsoever... not even his eyes. Laserbeak's 'Bot'-mode has no real articulation. You can attempt folding him up in a way that makes him look like he's sitting upright, but the spring mechanism keeps him fully transformed. To fold Laserbeak back up, rotate his wings backwards, This will also pull his head and neck to the back. Fold his head forward. Fold the tail forward to cover the head and then fold the wing sections into the body and snap them into place. Now you have an awesome Cybertronian data-disc that is about as action packed as a cassette tape. Soundwave's built in gimmick is a sort of launching mechanism that 'shoots' out his data-disc minions. The minions are spring-loaded and are made to transform during launch or on impact. 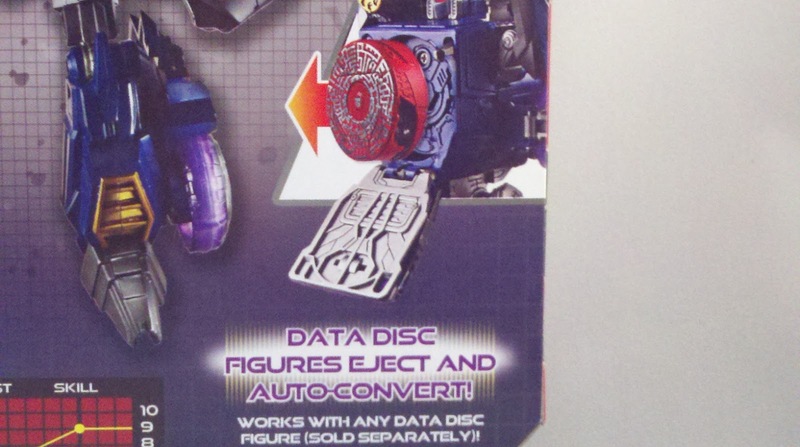 Laserbeak has a small post on the disc underside that when pressed, spings Laserbeak into his 'Bot'-mode. On Soundwave's Alt-mode, you will find a small grey trigger. Press this down and the front of the Alt-mode springs open. To 'launch' Laserbeak, the upper section of the Alt-mode is on an arm, push that section forward and it will in turn push Laserbeak forward. There is a small lip around the opening that once Laserbeak is forced over, he will launch out. 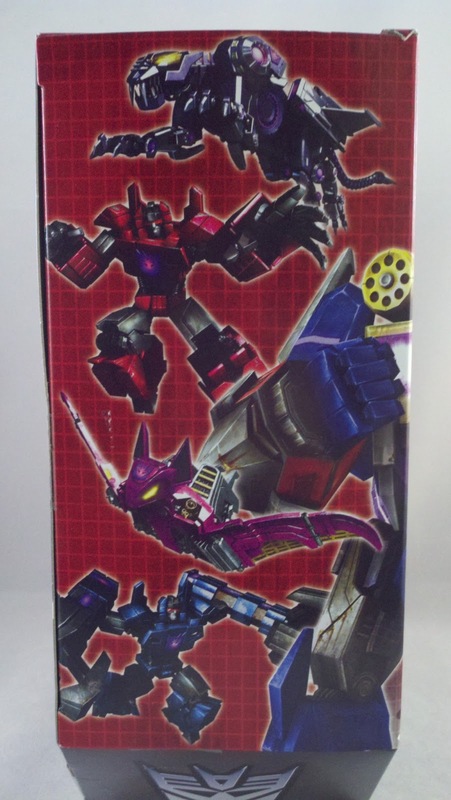 In theory, Laserbeak's transformation will either be triggered on launch, or when he lands... in theory. 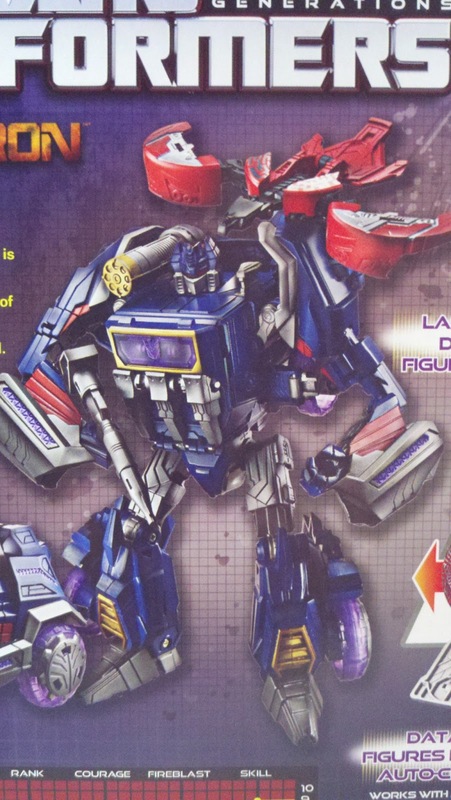 Soundwave's transformation is fairly similar to his Deluxe counterpart. To start Soundwave's transformation, remove the missile pod from the top of the Alt-mode. Swing the roof section up to allow the feet to and legs to unfold. Rotate the rear fender and wheel sections 180 degrees. There is a grey waist piece snapped into place to the blue main body. Un-snap this and swing it under to form the waist and allow the legs to be... well... the legs. Expose Soundwave's head by folding the two pieces on the roof upward. Follow this by unfolding his arms, they make up the side of the vehicle and unfold towards the back. Fold Soundwave's chest flat and transform his shoulders moving the hinges the arms are attached to from a lower position to a higher position. Fold the front wheel arms towards the back. Close the panels on his upper arms to finish his shoulders and swing his arms down. Soundwave's back is comprised of the top of the Alt-mode and what basically amounts to his gimmick's launching mechanism. It is a 3 hinged arm that just folds in on itself. If there are no minions stowed inside his chest, the arm can be pushed all the way in. Stow any number of minions... and it hangs out on his back pretty far and only looks silly. Finish Soundwave's Bot mode by simply rotating his arms at the bicep, folding out his hands, and mounting his missile pod to his shoulder. Soundwave is very true to his on-screen look. He's definitely an up-scaled version of his previous Deluxe incarnation. The pics below show Soundwave set up with Laserbeak packed in. Notice how the back piece sits so far off the back. While I understand the gimmick, I don't like how it makes the figure look. Soundwave has quite a bit of articulation built in. There are plenty of hinges, ball joints and swivels to allow for a myriad of poses. His arm can even fold up enough to 'eject' his minions. Pressing the grey 'ejector' button on his shoulder pops Soundwave's chest open. But, this isn't enough to set his minions on their varied operations. This will require a little effort on your part. The launching mechanism on Soundwave's back need to be pushed forward. The small lip around the housing will cause the data-discs to 'pop' over it and launch out. The idea is that either during launch, or upon landing, the minion springs to it's Bot-mode. After several tries with Laserbeak, the best I got was a data-disc with a wing. The disc either needs to be hit just right, or land just right for it's transformation to occur. As I mentioned earlier... it's all good in theory. Despite the semi-functional gimmick, Soundwave is a really nice looking figure. Due TO the gimmick, he's a tad barrel chested, but it really doesn't detract from the overall look. I do wish the minions we're built to transform manually instead of being spring loaded; it would have made for a much better update to the characters. The gimmick just makes them less poseable and only really useful in their Alt-modes. I'll be getting to them later. I'm glad Soundwave got a bump in scale, I have always liked the character. But as I said, I wish they'd have put more thought into his minions as compared to some semi-functional gimmick. The only other downside is that he doesn't fit into scale with the rest of my collection, so if anything, he's going on his own Soundwave shelf... where he will be a little lonely as I don't have many other Soundwaves. I dug out my two other easy to find Soundwaves... both, deluxe version of the FoC chassis. The left most is the UK United version, the right most being the Hasbro Generations version. Of these two, the United version is my favorite; the metallic paint job is just pure win. 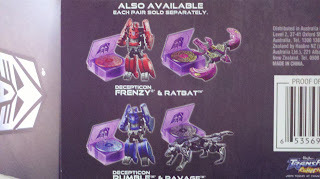 Stay tuned... coming up are the rest of Soundwave's data-disc minions; the two-packs of Rumble/Ravage and Frenzy/Ratbat! Pics, Review and EJECT! Operation: Review... by Scion of Primus. Awesome - don't forget, that front chest panel/tape deck door, can be propped open to make it look like he's ejecting discs without having t have the whole door just hanging open! Its not even in the instructions, but I mean, c'mon, there's no other reason to have that door the way it is! It looks perfect! I managed to get this guy online for christmas, and I think he's the best TF we've had in ages. Nicely solid, in no way lacking in size and decently painted. Just wish his gimmick worked a bit more smoothly.